The Italian Futurists celebrated technology, youth, and violence in their avant-garde works. Selena Daly, a professor and expert on the movement, explains its role in shaping Italian society. This article is based around a transcript of a segment from The Anthill 10: The Future, a podcast from The Conversation. 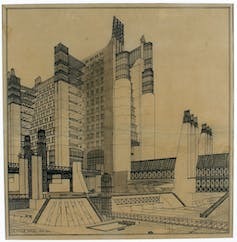 Gemma Ware, society editor at The Conversation and a producer of The Anthill, interviewed Selena Daly, an expert on the Italian Futurists. When the Italian journalist Filippo Tommaso Marinetti went off to the frontlines of World War I, he was thrilled to be pedalling there on a bicycle. Back in 1915, bikes were an avant-garde mode of transport – and Marinetti was an avant-garde kind of guy. He'd made waves across Europe a few years earlier when he launched the Futurist Manifesto. Selena Daly: Marinetti, who was a master at advertising and self-promotion, got the first manifesto published on the front page of the Paris daily newspaper Le Figaro in February of 1909. This really was a very bold launch of an artistic and cultural movement at this time and got a lot of attention also around the world. Selena Daly is a lecturer in Italian studies at University College Dublin and an expert in the Italian Futurists. Marinetti's vision of the future was built around high praise for technology and the aesthetics of modernity. SD: So he praised in this manifesto the speeding automobile, steamships, locomotives. All of these technologies that perhaps to our eyes now may seem a little bit quaint but at that time were really at the cutting edge of technology. So very famously, Marinetti in that manifesto praised the speeding automobile as being more beautiful than the famous Greek sculpture the Winged Victory of Samothrace which stands in the Louvre then and still today. It was a movement that began with literature and poetry and spread to sculpture, fine art, music and even textiles. For example, this 1921 piece called Fox-trot Futurist by an Italian composer, Virgilio Mortari, was influenced by the Futurists. Marinetti's vision was as destructive and provocative as it was creative and forward-thinking. SD: He felt that Italy as a country was completely weighed down by the baggage of the Renaissance and the baggage of ancient Rome and its classical past. And he really wanted Italy to just stop looking backwards always and instead look to what the future could offer them in terms of inspiration for art and literature. And in that first manifesto he says he wants to rejuvenate Italy which he found very stagnant and therefore he said that everyone should set fire to the libraries, flood the museums and in this way break all links with the past. With World War I in the offing, Marinetti and his band of followers quickly agitated for Italy to join the fight. They felt that war would help bring their Futuristic vision into being. SD: One of the most famous slogans that Marinetti coined was in that very first manifesto where he said that he praised war as the “sole hygiene of the world”. The idea there should be a purging war which would rid Italy and Europe of all of its obsession with the past and they could move forward to a brighter future. It took nine months for Italy's leaders to agree to join the war – during which time the Futurists campaigned vigorously for intervention. 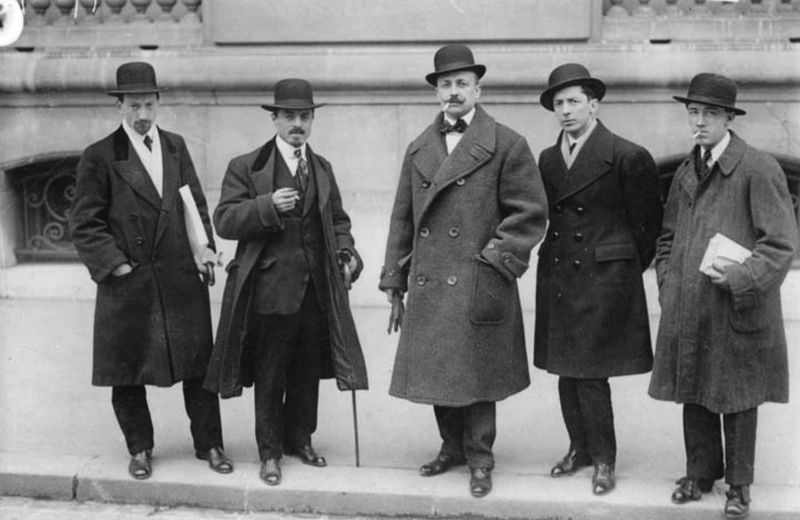 When Italy did enter the war on the side of the Allies in May 1915, Marinetti and his group of fellow Futurists signed up as soon as they could. SD: They were terribly excited by the bombardments. They found this to be an inspiration also for their art and in very many ways putting into practice what they had preached and what they had thought about and imagined in advance of World War I. When the war ended in 1918, the Futurists went through an intense period of political engagement, forming the Futurist Political Party – and forming a close alliance with Benito Mussolini and his Fascist movement. The Futurist party wanted to make Italy great again. They wanted a country that was no longer in “servitude to its past” where the only religion was the “religion of tomorrow”. Their manifesto promised revolutionary nationalism, and included ideas such as totally abolishing the senate and the gradual dissolution of the institution of marriage. SD: But in the end of 1919 there were Italian elections and the Futurists and the Fascists performed disastrously. So they received less than 2% of the vote in Milan and it's at that point that Marinetti actually decides that parliamentary politics isn't for him and he withdraws. He disbands the Futurist political party and he withdraws completely from parliamentary politics because he feels disillusioned and he feels that the message that he has isn't getting through. Post-1920, Futurism no longer goes down the parliamentary politics route but it was, after 1924, very closely aligned with Mussolini's Fascist movement. So while they may not have been engaged in parliamentary parties they were very much on the side of the Fascist regime and that didn't change at all during Marinetti's lifetime. Marinetti's association with Fascism has tainted the Futurists' legacy ever since. SD: Obviously some Futurists distanced themselves from the movement because of this alignment with Fascism. But others didn't. It's interesting – a lot of the art in the 1930s and some of the 1940s is what can be described as Fascist pro-regime art. There are a lot of portraits of Mussolini done in a Futurist style for example. And the Futurists, while they were never the official state art of Fascism – because Mussolini never wanted to proclaim one art to be the state art of Fascism – the Futurists were still featured at official events and did have this very strong alignment with Musssoini's regime at that time. Marinetti's allegiance to Mussolini went right up to his death in 1944 in Bellagio in the north of Italy, near to the puppet regime run by Mussolini towards the end of World War II. SD: Because there was such a cult of personality also around Marinetti – and he was really the focal point of the entire movement – it did rather peter out at that stage after his death and then at the end of the war as well. So there were surviving Futurists who did try in the 1940s and 1950s to keep Futurism alive and there was an interest in Futurism most definitely, but it was tainted by Fascism and there was a reluctance in many circles to really address the Futurist art and Futurist literature on its merits because of the shadow of Fascism that was hanging over it. Italy's relationship with Futurism is still complicated, but some Futurist images have remained iconic. SD: There is a sculpture of Boccioni, one of the most famous Futurist artists, actually featured on the Italian Euro 20 cents coin, just to give an indication of how important the Futurist aesthetic is to a vision of modern Italy today. Boccioni, died actually in 1916. He died under arms, he actually fell off his horse in training so he didn't have the glory of a battlefield death that he may have wished for because he was also very belligerent. But he was never tainted by Fascism because he died before Fascism actually came into being. 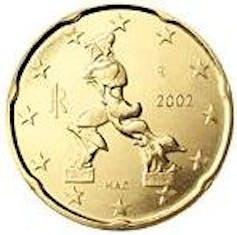 So therefore it's much easier to place a Boccioni sculpture on a Euro coin in Italy because he doesn't really have those other connotations and other associations with Fascism. And the Futurists did help shape the way others in the 20th century went on to imagine what the future could look like. SD: The Futurist aesthetic had a very profound influence on the language of advertising for example in the 20th century. For example, BMW recently said that they were very much influenced by the Futurist aesthetic in the design of one of their cars. There are fashion houses that are still using Futurist prints and Futurist textiles to inspire their collections. There is still an affinity for the Futurist aesthetic even today. So while Marinetti's technological, streamlined vision of the future may have been born out of a specific political moment, it has continued to resonate. Even the generic use of the word Futurist today remains strongly connected to Marinetti's vision from 1909.